To improve the ready-made garment quality, somehow you need to reduce the defect generation in the garments at the source. To know the defect source and taking action in reducing defect generation, you need to know the defects, cause of the defect and its effect. The analysis of defects and types of defects present in the garments, frequency of defect generation and source of defects can be done better through the garment defect classification. Raw materials (Fabrics and trims) - All kind of fabric defects fall under this category. Examples hole in the fabric, shade variation, slubs, missing ends/pics. See the list of fabric defects in this page. Cutting defects - Defects generated in fabric cutting process. Stitching defects - Defects generated in garment stitching, like a broken seam, seam puckering, skip stitches, pattern mismatch etc. Read the list of detailed garment defects in this post. Pressing defects - Defects like shining, water mark and incorrect pressing. Printing - Printing defects may be in the fabric or garment stage. 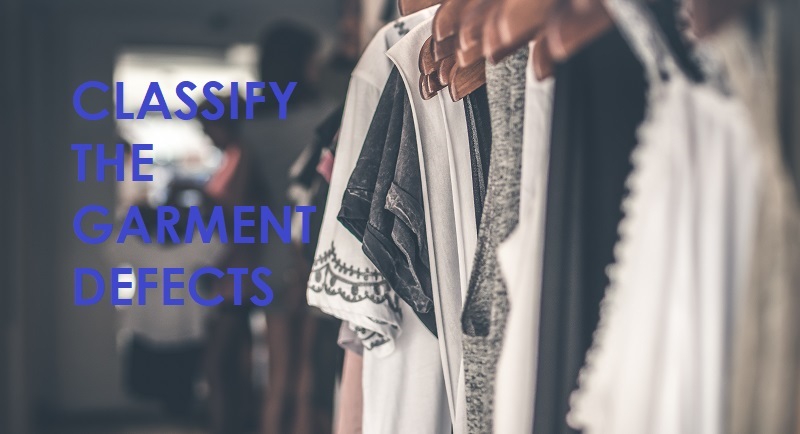 When it comes to quality inspection and quality data analysis, quality inspector (auditor) should judge the defect severity and position of the defects in a garment. Critical defect: A critical defect is one that judgment and experience indicate will result in hazardous or unsafe conditions for individuals using or maintaining the item. Major defect: This is a defect sufficient to render the merchandise second quality or unacceptable because it is conspicuous and/or may affect the saleability or performance and/or is a significant deviation from the established specification. Minor defect: This is a defect that is not likely to affect the saleability or performance and/or is beyond the defined quality standard is known as the minor defect. These defects classes are used in ready-made garment shipment inspection and internal auditing and for the different AQL level. Focus on the critical areas that cause quality issues in garments. Garment defect classification for your product groups. Analyse the common defects and find the defect source easily through defect classification.